Stripping Spring Assemblies - T.R. Goldsmith & Son, Inc. 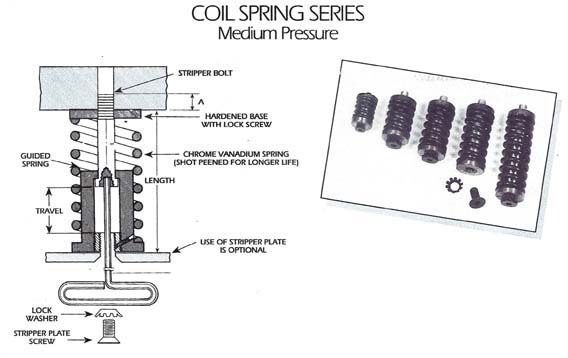 These Stripping Spring Assemblies, also known as Coil Springs, are designed for medium pressure applications such as blanking, piercing and forming dies along with many other uses. Simply drill and tap 3/8″ – 24 location holes for each assembly. (1/4″ – 20 tap for catalog A-I 50). The coil spring assembly can be used with or without a stripper plate if the design is suitable. A 3/8″ – 24 x 3/4″ large flat head screw w/ lock washer is furnished for retaining a 1/4″ thick Stripper Plate (1/4″ – 20 X 112″ screw for CAT. A-150 ONLY). Part# Length O.D. Thread Length Screw Size Wrench Size Travel lbs. per 1/8" Load Lbs. Load Lbs. If a stripper plate is used, caution must be used to make sure the screw does not enter the travel area as shown in drawing provided. Cap screws may be used for holding the stripper plate, however, this would require a much thicker plate to accommodate the thicker head on the screw. Some users save additional time and money by only attaching a portion of the assemblies to the stripper plate, provided the design is suitable.